Ask Willie Stylez - The Blog! : Wierdness @ Walmart! As many of you know, I am an avid Walmart shopper! I go there daily!!! Sometimes I even go there when I don't even need anything (some of you know the story of how my auto-pilot kicked in on a tired drive home, I ended up @ Walmart Taylor for NO REASON! LOL!). I have even been involved in debates where I justify my love for the Walton Empire, over Target, Kroger and Meijer! LOL! Well, until today! I just went up their, and oh my god, there is some weird stuff going down up in Walmart during the day. Its funny because I usually go to Walmat late at night, where you expect weirdo's, freaks, recluses! But no, not at Walmart, where midnight brings out the best of shoppers (apparently) or a nice quiet evening of strolling through the aisles with no care in the world! Well, today, I got a "weirdo wake-up call"! It started with walking in the door! I encountered my first weirdo, a gigantor of a she-male! LOL! This guy/chick had to be at least 6'10" PLUS had on platforms! Then I went in further, found everything from families with that uncle you never let out, to the guy with the outfit on that screams, "No Shirt, No Shoes, No Service, and your shirt DON'T count!" LOL! Then I saw this crazy looking chick with like the BIGGEST head I had ever seen a person. And I don't mean just a big head, I mean this chick had a big head, big face, big hair and this small little body! It was nuts. Her body said she was 5'2", but the head made her look 6'1"! So after seeing all that and more, I ran to the back, grabbed the 2 milks I was coming for, and I got the hell outta there! 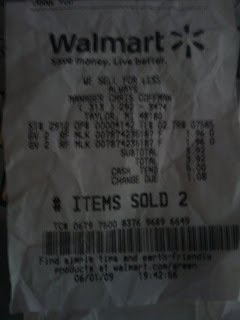 That was the quickest and cheapest Walmart run I had EVER made! LMAO!